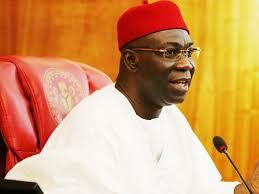 Deputy President of the Senate, Senator Ike Ekweremadu, has described the return of the former Vice President, Alhaji Atiku Abubakar, to the Peoples Democratic Party, PDP, as a welcome development, not only for the party, but the nation’s democracy. Ekweremadu said the move represented a massive Vote of No Confidence in the leadership capacity of the ruling All Progressives Congress, APC, first, by the masses, and now by the cream of its hierarchy and founding members. He said: “The dumping of the APC by Alhaji Atiku is a welcome development for the PDP, but more importantly, Nigeria’s democracy. “Nigeria is in dire need of a rescue mission to rekindle hope in our democracy, restore her on the path of prosperity, and halt the worsening divisiveness that threatens our corporate existence. “I, therefore, enjoin all former PDP faithful who left for various reasons as well as other progressive-minded Nigerians to emulate Alhaji Atiku, to reunite under the umbrella to salvage the nation because I see a new and better Nigeria coming in 2019. “I see a country where corruption will be eradicated, a nation that will be a pride to Africa and admiration of the international community, and a nation where no man will be oppressed, intimidated, persecuted or sidelined on account of ethnicity, religion or political persuasion. “No amount of desperation will stop the will of God for Nigeria in 2019”.